MARION de BOOY WENTZIEN has twice been a recipient of the PEN Syndicated Fiction Award and has won the University of Missouri-Kansas City's New Letters Literary Award. The Chicago Humanities for the Arts recently presented a story in their Stories on Stage program. 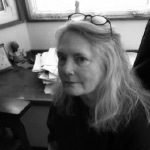 Her stories have appeared in Seventeen Magazine, Blue Penny Quarterly, The San Francisco Chronicle and Scholastic Books, Story Magazine, The St. Petersburg Times, The Village Advocate, Chapel Hills, NC, On the Page, Big Ugly Review, The Quotable, Prime Number, The Sonora Review, The Stone Hobo and other literary journals. She lives in Saratoga, CA with her husband and some formerly stray animals.